It's time for Secret Recipe Club again. This is my second month participating and I am loving it. First there is the excitement of getting the blog you are assigned and picking out the recipe you are going to make. Then on reveal day the excitement of seeing who got your blog and what they made. This month I was assigned a fantastic blog, Healthy Delicious. I love the name of this blog because it is exactly what I try to do...make food that tastes great and is still healthy. Healthy Delicious is written by Lauren who has been cooking since she was only 10 years old (opposite of me who started when I was on the verge of getting married). I love her philosophy of eating great tasting food in smaller portions rather than large portions of food that doesn't taste so great...everything in moderation! Please do visit Lauren's blog Healthy Delicious and check out some amazing recipes and photographs. I had a hard time deciding on what to make. I first gravitated toward the Indian dishes because I know I will have all the ingredients and in our home you can't go wrong with Indian food. But we have it all the time so I decided I should go for something different. Initially I didn't want to make something sweet because really I have no self control lately when it comes to sweet things. But these cookies caught my eye...they had dried yellow peas in them. Now that is an unusual ingredient in a cookie! I immediately assumed this was channa ki daal (yellow split lentils) so I used those. After making the recipe I wasn't so sure if yellow split lentils are dried yellow peas. Regardless these turned out very good. The boys loved them and they didn't last long. If you do give them a try make sure you make the daal into a smooth paste. If there are any clumps they will harden up when you bake them. Next time I will use my immersion blender to get to a nice paste. I also recommend soaking the daal so they cook faster. I also replaced the peanut butter chips with milk chocolate chips to make it nut free and use vanilla bean paste instead of the espresso powder. The dough was crumbly so I pressed about 1 tablespoon of dough in my hand gently to form a ball. In a small pan, add the lentils and water. Bring to a boil and allow to simmer for about 30 minutes or until water is absorbed and lentil are soft. Check on it after 15 minutes to make sure it doesn't burn and there is enough water. I didn't soak my lentils and ended up using 1 1/2 cups of water and it took 45 minutes to get soft. Once soft mash with the back of a spoon or puree in an immersion blender. Make sure there are no pieces otherwise they will dry up when you bake the cookie. In a medium bowl, combine butter and sugar using an electric mixer on medium-high speed until soft and fluffy. Add the mashed lentils and vanilla bean paste. Mix until combined. In a bowl, stir together flour, salt, cocoa powder and baking powder. Add the dry ingredients to the lentil mixture and stir together until just combined. Transfer to a small bowl and chill for at least 15 minutes (up to overnight). Note: the mixture is crumbly. Preheat the oven to 350 F. On a parchment lined baking sheet, gently form about a tablespoon of dough into a ball and place on prepared baking sheet. Bake for 9-12 minutes, or until just set. What an interesting ingredient for cookies! They look great! Cookies made from lentils?! I would have had to try this recipe, too, it is so unusual but sounds so delicious! Great job! This is really intriguing! I've never heard of baking with lentils before. I too am completely intrigued, will have to give these a try, they look fantastic! Very inviting n delicious cookies,yummy !! 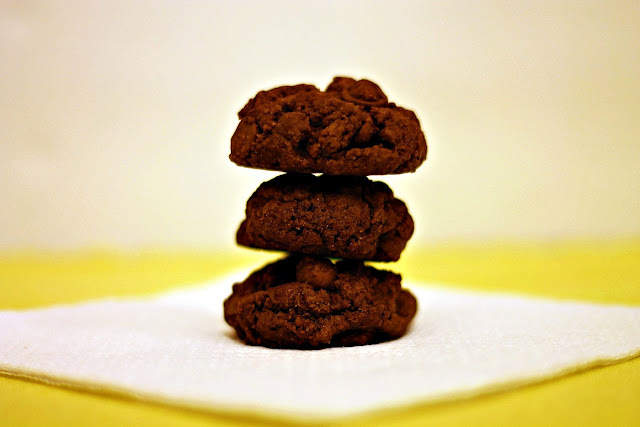 Who would have thought that lentils would work so well in chocolate cookies? These look delicious! Hmm I've never thought to put lentils into a baked good, but these sound quite tasty! I have heard of brownies being baked with black beans but I've never tried it...mostly because I would end up opening a whole can and not using it and then trying to figure out what to do with the rest. Love the lentils in these! I need to figure out a gluten free way to make them! THanks! I believe the original recipe is gluten free. I have the link above if you want to check it out! These look delicious, I love that the cookies have lentils in them. Amazing. I love seeing legumes used in desserts. They add such a nice moistness. There's a little devil in me that likes telling unsuspecting people that they are eating lentils, peas or beans, too. Lentils in cookies? It certainly seems to have worked, they look delicious. these sounds sointeresting. I pick up lentils all the time. I have to try this. I pinned it! Looks like they turned out good! I'll have to try these on the husband to see if he notices. ;) We just launched the all new seasonalpoluck.com and I'd love if you would check it out! April is peas month, so if you have any great pea recipes, join the fun and link up! We'd love to have you.